In a racially polarized classroom in 1970 Alabama, Lu’s talent for running track makes her a new best friend — and tests her mettle as she navigates the school’s social cliques. Miss Garrett’s classroom is like every other at our school. White kids sit on one side and black kids on the other. I'm one of the few middle-rowers who split the difference. Lila Quintero Weaver was born in Argentina but grew up in Alabama, where she still lives with her husband. She is the author-illustrator of Darkroom, a graphic memoir. 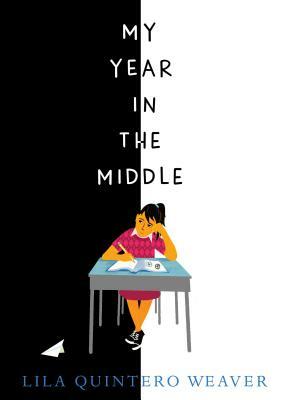 My Year in the Middle is her first book for young readers. Based on true events in Lila Quintero Weaver's own 1970s childhood as an Argentinian immigrant in a small Alabama town, My Year in the Middle is a moving story about finding one's center in the midst of overwhelming external pressure. Lu is believable as a girl who is afraid to "stick [her] neck out too far. "...Any reader who has struggled to find a safe and happy place between polarities will appreciate Weaver's deep understanding of just how difficult—and rewarding—this can be. It's not always easy standing up for what is right, but sometimes, you just can't stay in the middle...Young readers will relate to Lu as she navigates friendships, first love, and politics, cheering her on to the finish line. An important and relevant story that will make kids stop and take a look at the world around them. Readers will be immediately transported to early 1970s Alabama in this story about Lu Olivera, a sixth- grader who finds herself drawn ever more deeply into the civil rights movement and politics at her school...This story is inspired by the author’s experiences, and it shows in introspective Lu’s observations of people around her. An excellent read for any budding activist or history buff, as well as pretty much any kid who likes a story about kids finding their gumption. Readers will root for this spirited protagonist to find her moral footing in this solid, enjoyable work of historical fiction. Based on true events in Lila Quintero Weaver's own 1970s childhood as an Argentinian immigrant in a small Alabama town, My Year in the Middle is a moving story about finding one's center in the midst of overwhelming external pressure...Any reader who has struggled to find a safe and happy place between polarities will appreciate Weaver's deep understanding of just how difficult—and rewarding—this can be. Young first-generation immigrants will see themselves reflected in Lu when she translates for a Cuban neighbor, and again when she finds herself “in the middle” and must either stand with her friends Belinda and Spider or side against them with her silence...A well-drawn depiction of an immigrant experience with a social justice lens. A solid addition for public and school libraries. Inspired by the author’s childhood, this work of historical fiction offers an insider voice and unique perspective on the era, reminding readers that race relations remained contentious long after the 1964 Civil Rights Act...This is a worthy choice for recreational reading and informing students about the civil rights era.